Balloons took the place of lungs, a tub of water and ping pong balls represented blood, and magnets acted as antibodies. These were just a few of the experiments that took place at the first Science Sisters Day, hosted by biomedical graduate students from Loyola University Chicago. 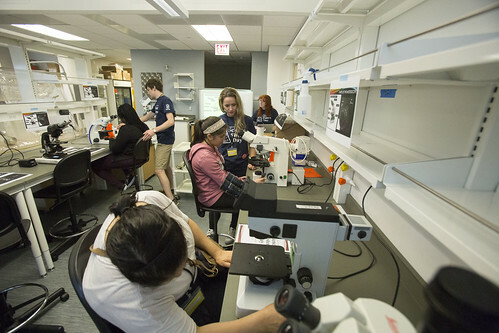 The full-day event brought 30 middle-school girls from local schools—Stevenson Middle School in Maywood and Irving Middle School in Melrose Park—to the Center for Translational Research and Education on Loyola’s Health Sciences Campus for a day of educational science experiments and learning about women science pioneers. “Interest in science drops off at this age, so we wanted to target these girls and hopefully help keep up their interest in science as they get closer to high school and college,” said Abby Cannon, one of the Science Sisters Day organizers. Cannon and Anya Nikolai, both immunology graduate students, who also founded the Women in Science group at Loyola, wanted this event to address the underrepresentation of girls pursuing education and careers in the sciences. Research from the U.S. Department of Education shows that girls lose interest in math and science sometime around middle school. A report from the National Research Center for College and University Admissions found that only 20 percent of women intend to major in a STEM (science, technology, engineering, math) field. Science Sisters Day was a way for these girls to get some hands-on experience with science and continue to nurture their interest in the field. “This event gave young girls hands on experience with the types of biomedical research we do at the Health Sciences Division and taught them about successful female scientists, with the hope that these students will realize that they, too can aspire to careers in science and medicine,” said Leanne Cribbs, PhD, Associate Dean for Graduate Education at the Stritch School of Medicine and an associate professor in the department of Cell and Molecular Physiology. Susan Baker, PhD, professor in the department of microbiology and immunology, lead an activity that taught the girls how viruses and bacteria are different than the body’s normal cells. They then made their own bacteria and viruses out of model clay inside of a petri dish. One experiment had the students learn how antibodies work by mixing iron filings in with salt, and then using a magnet to attract the iron. The iron represented viruses and the magnet was the body’s antibodies, showing how the memory cells of an antibody can tell the difference between the body’s healthy cells (salt) and viruses. Another had students extract DNA from strawberries, showing how cells can be broken open and DNA can be separated out and studied. The importance of sunscreen was shown in using different SPF strengths on UV beads that changed colors when exposed to the sun. The event was funded by Plan 2020, Loyola’s five-year strategic plan that aims to use its influence to help better society and its surroundings, along with support from BioLegend, a lab supply company. Cannon and Nikolai are also planning more events with their growing Women in Science organization, including seminars and lectures hosted by prominent female scientists in many different fields. “We really want to see what we can do to keep our female scientists interested and invested in their career and moving up the ladder into leadership positions,” said Nikolai.